It's easier to get in and out of bed with Standers' BedCane. Strong and sturdy, the steel "cane" with cushion grip handle is mounted on a board that secures between your mattress and box spring. 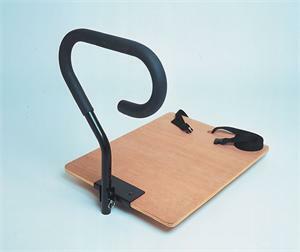 Easy to install and folds down for travel or storage. Attaches securely to any size home or hospital bed with included safety strap. Adjusts from 19 to 22" high and can accommodate the thicker pillow top mattresses. Each unit also includes a 4-pocket BedCane Organizer that gives easy access to items needed close to the bed. • Free Organizer included-4 pocket organizer prevents entrapment and provides storage of handy items. • Quality Steel and Wood Construction–Heavy duty steel with powder coat finish provides long lasting quality. • Portable–Handle folds down for storage and portability. • Safe & Secure –Safety strap secures base to bed frame and mattress. • Comfortable Handle–Foam grip handle. • Sanitary–Closed Cell foam is easy to sanitize. • Reversible and Adjustable–Fits on either side of bed and adjusts in height to fit your mattress. • Does it work on a Craftmatic or adjustable bed? Yes, just secure the bed rail above or below where the bed folds.